Here’s a Page to Help Keep Up Nature’s Splendor! !All around us is the unbridled beauty of nature. A cascading waterfall, a moonlit sky, a bird in flight. In today’s modern society, however, the natural world is steadily in decline as cities and technology expand into an ever-growing network of concrete and steel. Fortunately though, there are some places where the impact of mankind has been avoided, and nature can flourish. As photographers, it’s essential that we capture the raw essence of this beauty not only for esthetics, but to preserve our surroundings for future generations. Had the camera been invented in ancient times, who knows what untold treasures could have been locked in time for us to witness. A hundred years from now, such images could be priceless to our distant kin. The goal of nature photography has been, and should be, to be as authentic as possible. Capturing moments of animals and plants as they are, without human intervention, is one of the cornerstones of documenting the natural world. This can be difficult, however, as many wild animals avoid humans for a variety of reasons, and as such finding the right time and place can be crucial. 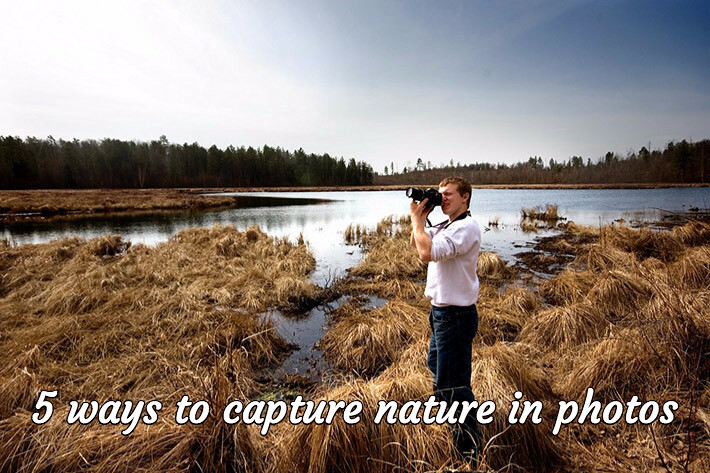 Below we’ll discuss five ways you can maximize your photographing potential when it comes to snapping images of Mother Nature. While it is tempting to be able just to grab a camera and head out into the great unknown, if you want to capture truly stunning images, then you need to do your homework. Although this isn’t the most glamorous part of photography, it can be the most important piece when it comes to nature, as there are so many elements and variables that can come into play. It may be difficult to know what exactly you want to shoot, but try to figure out a general guideline and tailor your research to fit. For example, if you want to shoot a beach scene, you’ll need to figure out which beach to shoot at, the best time of day to go when there aren’t many people around (unless that’s part of your shot), and where you can legally wander to get the best composition. It’s best to visit your locations multiple times to really get a sense of what will work and what won’t. Go at different times of day, explore new areas, and test your shots as you go. Luckily with today’s digital cameras you can take hundreds of pictures without it costing you anything but time. This is probably one of the most important considerations you have to think about, as it is the one thing you can’t control. Even if you find the perfect spot, the perfect moment, the perfect composition; if the lighting is wrong, then the image will suffer. Most nature photographers like to shoot in the early morning or early evening, as this creates the most dynamic lighting. Shooting during the height of the day can lead to stale, washed out images with flat light. This is not, however, to say that you can’t shoot during the middle of the day, but in order to maximize potential, play with shadows and different angles to mitigate any adverse effects the light can have. Going hand in hand with research is figuring out your game plan ahead of time. Since there are so many variables when it comes to nature photography, you need to consider every possibility, so you don’t get caught in the right place at the wrong time. You need to figure out what type of gear you need, including lenses and batteries. Typically for landscapes you will want a tripod of some kind to keep your shots level and clean. Additionally you need to plan things that aren’t related to taking photos, such as your route, where you will park, how long you’ll be out, any expenses (such as park admission), etc. etc. The more you plan ahead, the better prepared you’ll be in case of any eventuality. Ideally you’ll create a checklist of items to bring and have several contingency plans for unknown circumstances (such as weather). When it comes to nature photography, composition can be a bit tricky. Because you can’t alter the subject matter, it’s important to be flexible when capturing your images. Don’t be afraid to get a little dirty or wet when searching for the perfect shot, as rarely the best shot is taken from the safest angle. While there are no set standards for composition, there are some general guidelines to follow, such as the rule of thirds. You can also utilize natural forming lines to guide the viewer around the image. Even if there isn’t a physical line, such as a road, you can use implied lines through perspective and the horizon. It’s also important to utilize negative space when possible to accentuate your subject. Play around with different angles and camera settings to get the right shot. Sometimes it can take a hundred photos to find the perfect setup, so don’t think that you have to get it the first time. The overarching rule of nature photography is that, since you are the observer, you have to wait for the perfect moment to capture the best image. Since you can’t control the sun, the weather, or the living creatures out in the wild, you need to wait for all the elements to convalesce into a stunning photo. While some of this can be mitigated with research and planning, when it comes to capturing wildlife, it can truly be a waiting game. If you do shoot animals in the wild, it’s essential to research where they are located, what time of day they are active, and what kind of demeanor they have. Most animals will scurry at the sight of a person, so sometimes you need to stay in one spot and be as still as possible for nature to become acclimated to your presence. Once that happens, you can begin to capture the raw moments of life as they occur. Ultimately, Nature photography can be a tricky, fickle business, but at the end of the day it can lead to amazing images and stunning beauty. The most important thing to remember is that you are there to observe, not interact. The lesser your impact on the scene, the greater potential you have to create a vivid, authentic photo that will last forever.